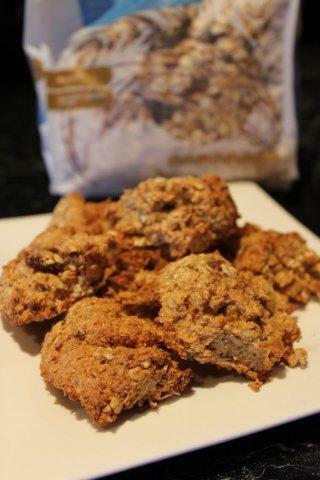 My husband like the Carmans muesli cookies as they are a more filling cookie, moist and rather tasty. Unfortunately they are quite pricey for us too so I took on the challenge to make something similar, less costly, lower in calories and perhaps even more natural. My special man can have almost 4 for the calorie count of one now and I have a low-calorie biscuit option now too. Kids loved them also. 3. Stir in all the dry ingredients and make a well in the centre. 5. Add milk, essence and egg to melted spread and pour into dry mix. Lightly fold mix adding enough of the water to make a thick but wet muffin mix. DO NOT OVER MIX. Mix only until just combines and spoon onto baking paper dividing into 38 portions.